With the myriad sources of game news coming out of hundreds of publishers, large and small, it's difficult for even the informed gamer to know which releases to look forward to. This list is an attempt to aggregate what the BGG community as a whole is anticipating, omitting my own personal biases as much as I can. This is a list of games sorted by what I call the "buzz score", that is, the number of wishlists the game is on minus the number of owners that game has. Most of the time, this will highlight games that are not yet released, but games may stay on the list after their release depending on how much people want them, and how quickly people have bought them. Obviously, games must be in the BGG database to be considered, but after that, there are no criteria beyond wishlists and owners. There is also a subscription thread for this Geeklist series. If you wish to receive a notification when I post future versions of this list, go over to The Buzzlist: Anticipated Releases - Subscription Thread and subscribe. While Alien Artifacts is technically the fourth expansion to Race for the Galaxy, it is part of a "new story arc"--the game must be played with the original Race for the Galaxy, but cannot be played with any of the other expansions. This expansion features new role cards for a fifth player, and the usual assortment of new planets and developments. Additionally, the expansion contains a number of "alien orb" cards that can be explored by the players, as well as a new Explore role card that allows them to do so. Players must balance building up their own tableau and exploring the mysterious Alien Orb. Release Notes: This game from Rio Grande should be available in November or December 2013. Eldritch Horror is a new cooperative game based on H. P. Lovecraft's Cthulhu mythos. Players will take on the role of investigators traveling around the world, struggling with arcane monsters, locating otherworldly gates, and unraveling the mystery of an Ancient One. The game claims to be highly narrative and will immerse players in this rich world. There will be three levels of difficulty to scale the game according to your play style. Release Notes: Fantasy Flight plans release this game in the fourth quarter of 2013. Caverna: The Cave Farmers is a stand-alone game that shares many of the same mechanics as Agricola: you use your family of workers to take various actions to develop your board for agriculture and animal husbandry, in order to feed your family and score victory points. Here, your player board is divided into two sections: the forest, which you can clear to plant crops or raise sheep, boars, cattle, dogs, and donkeys, and the mountain, which you can mine to provide living quarters as well as acquire ore and rubies. The ore can be used to create weapons and go on quests, which have better rewards the more quests you go on. Release Notes: This game from Lookout Games will be available in Europe at Essen 2013. The game will be distributed in North America through Mayfair. Rampage is a dexterity game in which players take on the role of giant city-destroying monsters. The goal of the game is to consume the inhabitants of the city--meeples of various colors. Players can flick or blow on the meeples, drop their monster on buildings to get the meeples out, or even try to battle other monsters to steal their stuff. You'll have to keep your diet balanced though--you only will score points for each set of six differently colored meeples that you eat. Release Notes: This game will be released at Essen 2013 by Repos Productions in Europe and Asmodee in the US. Dark Darker Darkest is a cooperative horror game in which a virus is quickly spreading throughout the world and turning the entire population into zombies. Players take on the role of "urban survivors" exploring the house of Dr. Mortimer, which allegedly contains an antidote to this virus. The game features modular gameplay with a strong exploration element. Players must overcome obstacles, extinguish fires, and fight zombies to make their way through the house. The game does not have a "dungeon master" player; all players are on the same side. Release Notes: Queen's Kickstarter project for this game has ended successfully. Backers have started to receive their copies, and the game should be generally available by the end of the month. 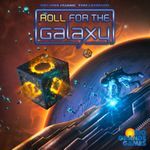 This dice game is supposed to emulate a lot of the feel of Race for the Galaxy, but be more accessible, shorter, and of course, revolve around dice rolling. Different types of worlds (novelty, rare goods, genes, alien, military, etc.) will have different colored dice that will each have a different mix of faces that reflects that type of world's strategy. It is rumored that this game will feature over 120 custom dice. Release Notes: There's no official release date from Rio Grande Games for this game, and it will not be at Essen. In August, Jay sounded hopeful it would be out by November. 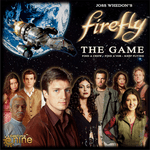 Firefly is a game based on the Joss Whedon's popular TV series. In the game, players captain their own Firefly-class spaceship, and must assemble a crew and take on jobs from more or less reputable (usually less) sources in order to "keep flying". Release Notes: Publisher Gale Force Nine has just released this game. Distributors are now shipping out copies. In Glass Road, players take on the role of glass-makers in the Bavarian forest. Players must clear the forest of trees, ponds, and pits to expand their business, and produce glass and bricks to create new structures. Each player starts with an identical hand of fifteen different specialist cards. At that start of each building phase, each player will play specialists--if someone else also plays that specialist, only one of the specialist's two abilities may be used by those players, but if someone is the only one to play a given specialist, both abilities may be used by that player. Release Notes: This game will be released at Essen (October) by Feuerland-spiele in Germany and Z-Man/Filosofia in North America. Copies should be generally available in November. Robinson Crusoe is a cooperative game where each player takes the role of a castaway on a deserted island. The game is scenario-based, so plays of the game will have various end-goals. Each player will have his own specialty, but they must all work together to gather food and supplies, as well as deal with threats that could derail the entire operation. The game will incorporate exploration mechanics, which will allow players to find new places on the island that may benefit them. The game purports to provide a variety of ways to address each scenario, making it difficult for players to agree on the best path. Release Notes: This game from Portal and Z-Man Games is now available, though supplies may be limited. Nations is a card-based civilization-building game featuring worker placement. Players buy cards from a central board and place them on their player boards. Later, they can use their workers in their buildings to produce resources, build up their engine, and produce victory points. The game will begin in prehistoric times and continue through World War I. Release Notes: This game from Lautapelit.fi will be debuted at Essen 2013, with Asmodee handling the North American distribution. 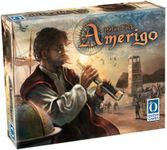 In this game, players aid explorer Amerigo Vespucci in his exploration of the New World and South America. The game utilizes a cube tower like the one found in Wallenstein/Shogun; each color cube represents the type of action a player can take, so the available actions will be different each turn. The game features a modular game board with 16 tiles, so the area you'll be exploring and settling will be different in each game. Progress tiles are available to give you in-game bonuses, and you have to make sure to watch out for pirates as you undertake your explorations. Release Notes: This game from Queen Games is shipping to Kickstarter backers now, and will be available for general purchase at Essen 2013. 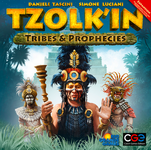 This expansion for Tzolk'in: The Mayan Calendar will feature (surprise) Tribes and Prophecies, as well as "quick actions". Each player will begin with one of thirteen different tribe cards, that will grant a special power that they can use for the rest of the game. Three of thirteen prophecy cards will also be drawn, which will change the rules for everybody for that game. Quick action tiles, like the start player space, allow players to place a worker and immediately get resources, without having to later take your worker off. The game will also include pieces for a fifth player, as well as replacement gold cubes for those with defective base games. Release Notes: THis game from Czech Games Editions will be debuted at Essen 2013. Rio Grande is doing the US distribution, which should be available in November. 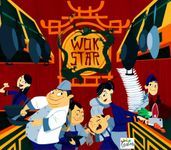 Wok Star is a realtime cooperative game in which players take on the role of restaurant chefs, working against time to fulfill the culinary desires of an endless stream of customers. A 20-second sand timer measures the amount of time you have to meet a customer's needs before he eats free. Each player has a different role in the restaurant, and these players must spend dice in different combinations to prepare ingredients. Release Notes: This game has been available in very limited quantities from the designer's website at www.wokstargame.com. A new edition by Game Salute has successfully funded on Kickstarter. Backers will receive their copies in March 2014. Lewis & Clark is a race game in which players take on the role of explorers trying to be the first to reach the Pacific Ocean. You begin with a hand of six multi-use cards, that can either be played for their action, or backwards with another action to determine the action's strength. You can buy additional cards to give you stronger actions. However, to get your cards back, you'll need to set up a camp, and if you're to loaded down with resources or unplayed cards, it will slow down your progress. Release Notes: This game from Ludonaute will be available at Essen 2013. Game Salute is doing the distribution in the US. 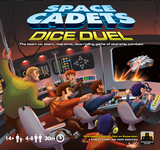 Space Cadets: Dice Duel is a real-time team-based game in which each team takes on the role of the crew of a space ship, trying to destroy the rival space ship. Individual players play a specific station on their ship, such as engineering, weapons, or helm, has a unique minigame that will determine how the ship moves and functions. The stations each have a set of custom dice that can be rolled and re-rolled to try to achieve your goals. Release Notes: This game from Stronghold Games has been released. Francis Drake is a worker placement game in which the possible actions are arranged in a line--like Egizia, once you take an action, you cannot take any action that comes before it in the line. These actions will equip your ships; once the worker placement phase is over, players will place face-down numbered discs at different locations representing trading, colonizing, attacking Spanish treasure ships, and attacking forts. Lower numbered disks will get the first shot at these actions, which will reward players with treasure, trade goods, or victory points. Release Notes: This game from Eagle Games is now available. Halloween is an expansion to King of Tokyo that includes two new monster figures: Pumpkin Jack and Boogey Woogey. Each figure comes with 8 new evolution cards, to be used with the evolution rules presented in the King of Tokyo: Power Up! expansion. Additionally, this expansion includes new Halloween-themed dice, and twelve new Power cards that represent Halloween costumes. Release Notes: This game from IELLO should be available around the end of October. This is the relaunch of BattleLore, a 2-player miniatures fantasy wargame based on Richard Borg's Command & Colors battle system. Fantasy Flight has thematically relocated BattleLore into their popular Terrinoth universe. The game is no longer scenario-based; instead, players randomly draw a card that shows their half of the terrain map, and each player is allowed to use up to a certain point value of units. While the Lore concept remains mostly unchanged, the War Council is gone--instead each faction has its own deck of Lore cards to draw from. Additionally, instead of gaining victory points for destroying enemy units, player now earn victory points for holding certain terrain hexes, as well as from their terrain map card. Release Notes: Fantasy Flight has listed a release date of fourth quarter 2013. Prosperity is a tile-laying game in which you're trying to build up your civilization without destroying your future with pollution. The game takes place over seven decades, from the 1970's to the 2030's. Drawn tiles will affect everyone's energy, ecology, capital, research, or prosperity, and then the player can take two actions, accumulating money, reducing pollution, or buying a tile. There is limited space on your player board for tiles, but new tiles can replace tiles of the same color is there isn't any room. Release Notes: This game from Asmodee will be available at Essen 2013. 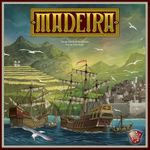 In Madeira, players compete to develop the Portuguese island of Madeira in the Atlantic Ocean. Dice are rolled and placed in spaces on the Guild board; players can then take a group of dice. Higher value dice means that they can be used in more areas, but but may want to take from a specific row to renew that guild's favor or obtain a specific Crown request. Dice can be placed on roaming character cards to use their action, and then the building that the character is currently in can be used. Players can also recruit pirates to help them on their tasks, but the pirate tokens you take might result in big penalties at the end of the game. Release Notes: This game from What's Your Game? will be available at Essen 2013. You can also order this online from What's Your Game?, but it may not make it to US game stores. Hegemonic is a 4X space empire game that takes place as factions are taking the first steps in exploring and conquering a new galaxy. Players gain resources in the form of CAPs according to their progress in industrial, political, and martial tracks. They can then spend those CAPs in taking each of a turn's three actions. Actions are simultaneously selected, and those actions will occur in a set numerical order. The player with the most leftover CAPs at the end of the turn becomes the Arbiter, who can manipulate turn order and action timing, and can also accept bribes from other players to do their bidding. At the end of the game, the victor is determined by assessing who has control over each region of the galaxy. Release Notes: This game from Minion Games will start shipping to Kickstarter backers in November or December, but should be available at Essen. The Krang Character Expansion adds a new player miniature and all the associated cards and pieces: Krang, the Orc Shaman. Krang may be chosen instead of another Mage Knight character (this does not allow a sixth player). Some of Krang's skills include Spirit Guides (+1 move/+1 block), Puppet Master (discard a token from a previously defeated enemy to increase attack or block), and Master of Chaos (a bonus that rotates each turn). Release Notes: This game from WizKids will be available at Essen 2013. Keyflower: The Farmers is an expansion to Keyflower that adds a number of new tiles to the game, featuring the new resource Wheat as well as three animals: Sheep, Pigs, and Cattle (which are represented by Agricola-style animeeples). The new tiles can be mixed randomly with the base game tiles, or they can all be used and base game tiles can be added to get to the required number. Animals are placed in "fields" that are bounded by roads and the tile edges--you'll score points for the number of fields in which you have animals. Wheat is used for extra transportation points, which now can also be used to move animals from field to field. Release Notes: This game from R&D games will be available at Essen 2013. Game Salute will be doing distribution in the US. The Pillbug is a new tile that can be added to the game Hive. 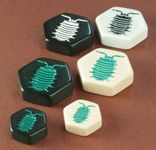 The Pillbug tile may move one space at a time (like the Queen Bee), or it may use its special ability. The entails moving an unstacked piece next to the Pillbug (either yours or your opponent's) over the Pillbug and to the other side. A piece moved by the Pillbug cannot be moved again in the next turn. Release Notes: This game from Gen42 Games should be available at Essen 2013.